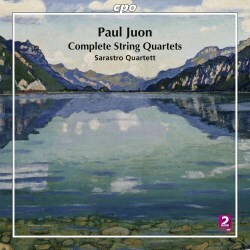 CPO have been at the forefront of promoting the music of the Swiss-German composer Paul Juon, having already released two CDs of his chamber music. The Swedish label Sterling have concentrated on the orchestral music. A contemporary of Scriabin and Schoenberg, Juon eschewed modern trends such as serialism and atonality. His music is both tonal and firmly rooted in late romanticism. This may explain why he has largely been forgotten and is only now being reappraised. He was born in Moscow in 1872 of Swiss parentage, with his mother boasting some Scottish ancestry. In 1889, aged seventeen, he was admitted to the Moscow Conservatory, where he studied violin with Jan Hřímalý and composition with Anton Arensky and Sergei Taneyev. His musical studies were completed in Berlin at the Hochschule für Musik with Woldemar Bargiel. Working in Berlin, he translated Anton Arensky's 'Practical Studies in Harmony' into German as well as Modest Tschaikovsky’s biography of his brother. He published his own book on practical harmonics in 1901. During this time he was employed by Joseph Joachim as a professor of composition. His students included Werner R. Heymann, Nikos Skalkottas and Gunnar Johansen. He retired to Switzerland in 1934 and died in Vevey in 1940. Juon dedicated his op. 5 Quartet to the Bohemian String Quartet ‘in heartfelt admiration’. It’s the only one of the four works to be cast in five movements, and dates from 1898. It opens in light-hearted vein, exuberant and upbeat and full of the joys of spring. Its mood is in stark contrast to the slow movement which is introspective and wistful. A graceful central episode, supported by a delicate cello pizzicato, interjects. Lehel Donáth’s rich cello line has great prominence in this movement. An energetic and vigorous Molto presto follows. In the Intermezzo fourth movement the composer puts the counterpoint he learned from Taneyev to good use. In the finale we return full circle to the opening theme of the quartet, the work ending in joyous spirit. The String Quartet op. 11 in B minor was probably the first to be composed, and it is the only quartet of the four which remained unpublished during the composer’s lifetime, though it received a premiere in 1896. On the manuscript, which was only rediscovered in 1997, an opus number 4 has been crossed out and the number 11 substituted. Lehel Donáth argues that the harmonies point to an early phase in the composer’s career, plus the work is heavily influenced by the Russian masters. Echoes of Tchaikovsky’s Swan Lake Waltz and the Violin Concerto are suggested. I hear a veiled reference to the Scherzo of Schubert’s A minor Piano Sonata D845 in the quartet’s Scherzo, with a bit of Dvořák thrown in for good measure; hints of Dvořák also permeate the finale’s Slavonic character. From 1905 we have the String Quartet op. 29 in E minor, like the op. 5, a large-scale work. In the Allegro Molto first movement one detects Russian and German influences. A beautiful cello solo ushers in a sombre, reflective and inward-looking Lento. There follows a Moderato with a distinctive oriental flavour, popular in Russia at the time; it has a catchy rhythmic lilt to it. The solo cello, echoing the previous Lento movement, welcomes in the finale which gradually opens out into an attractive Slavic folk dance. We leap forward fifteen years for the op. 67 Quartet, composed and published in 1920. It was dedicated to the violinist Carl Wendling, who had a string quartet that bore his name. This Fourth Quartet is compositionally more advanced than its predecessors and it doesn’t reveal its secrets as easily. The first two movements and finale are serious-minded, and it’s only in the third movement Allegretto that Juon lightens up a bit, with music that smiles. The busy scurrying textures inject an element of affability into the proceedings. These attractively seductive scores deserve the best in terms of performance and engineering and that is just what they get. The Sarastro Quartett’s utter commitment to the music secures convincing interpretations. The warm, intimate ambience of the recording venue allows the instrumental textures to be clearly heard. CPO’s comprehensive annotations, whilst technically detailed, favourably enlighten the listener. Juon is a composer who deserves to be heard more.